April 22, each year, calls for the celebration of the mother earth by protecting our environment through various awareness programmes and activities. 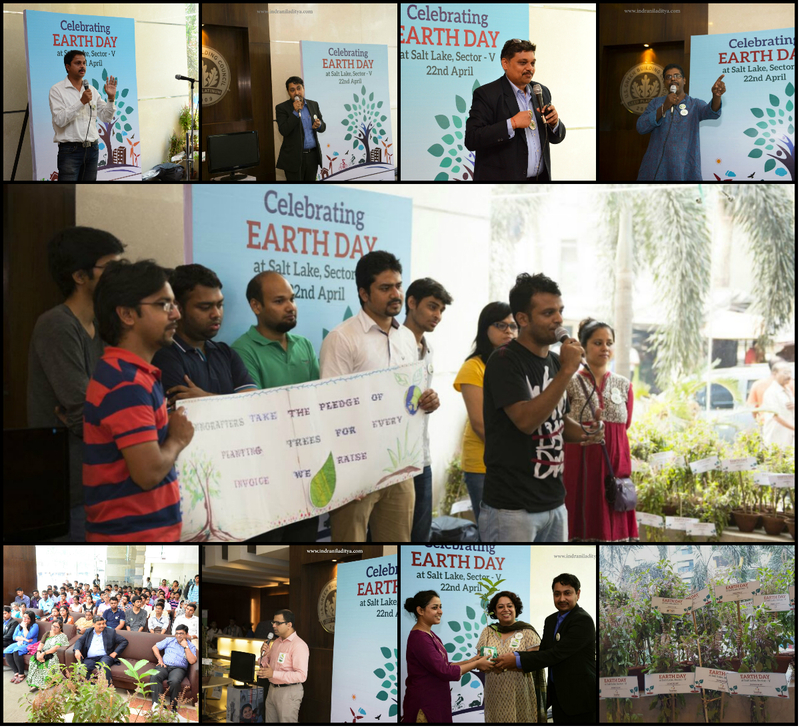 On the 46th year of Earth Day, dozens of corporate and individuals pitched in to sponsor 250 Tulsi plants that were to be distributed for free among the passers-by and placed at some important buildings of Kolkata’s IT hub. The speakers and the audience that numbered close to a 200 took the pledge of planting 1000 Tulsi in the coming few months. Coinciding almost with the time when India signed the Paris Climate Change Deal at the United Nations Headquarters in New York, Innoraft took a pledge of planting a tree for every invoice they raise for at least the next 5 years. “The global environmental issues are important to the people who are supporting this event today. I am happy that we all echo the same thought - it’s time to give back to the community and take small steps towards keeping the world green”, said Aninda Das, Manager - Corporate Communications, Infinity Infotech Parks Ltd., who was one of the initiators of the event. Among the eminent speakers there was Mr. Nirupam Chaudhuri, NASSCOM’s Regional Head, Navonil Das & Neela Majumdar from Earth Day Network (India), Mr. Sanjay Diwakar, Associate Director - Markets at KPMG, Mr. Sudipta Mukherjee, Director, Titagarh Wagons Limited, and Ridhwik Dutta & Bapi (da) from Amra Sobuj Sathi. Innoraft that sponsored 30 plants for the occasion took an oath of planting as many trees as possible. “We can't say that we will not use paper. Paper is needed everywhere. So, we take an oath of planting trees against every Invoice we raise. And we will do this for at least the next 5 years,” said Mukesh Agarwal, CEO & co-founder of Innoraft. The Earth Day celebration started 46 years back. Today Earth Day has grown to the point that now more than 1 billion people celebrate the day every year. The event in Salt Lake Sector V was celebrated for the first time and was organized by Anant Education Initiative and supported by Earth Day Network and Salt Lake Sector V Stakeholder’s Association and other corporations like Infinity, KPMG, TWL, Innoraft, Reddonatura, Susasthya and Hulladek and several others.